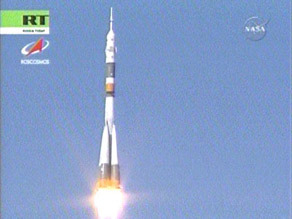 A new space station crew blasted into space through clear blue skies today from the Baikonur Cosmodrome in Kazakhstan. The Soyuz spacecraft carried Expedition 17 crew members Sergei Volkov, who will be the new station Commander, and Flight Engineer Oleg Kononenko. They were joined by South Korean space tourist So-yeon Yi, who at age 29 is the youngest woman ever to fly in space. Volkov is the son of veteran cosmonaut Alexander Volkov. Unlike NASA, Roscosmos, the Russian Space Agency, provides live TV pictures of the crew in the cockpit during the ascent into space. So-yeon Yi could be seen with a broad smile on her face, repeatedly giving the "thumbs-up" sign to the camera. Once in space, it takes the Soyuz a couple of days to "catch up" to the International Space Station, so docking will not happen until Thursday. Meanwhile, Expedition 16 crew members Peggy Whitson and Yuri Malenchenko are preparing to wrap up their six-month tour of duty and will return to Earth with So-yeon Yi in the Soyuz on April 19. Expedition 16 Flight Engineer Garrett Reisman will remain in orbit and become part of the Expedition 17 crew. Commander Whitson was the first female station Commander and oversaw one of the busiest periods to date in space station assembly. The Expedition 17 crew is expecting visitors in early June when astronauts aboard the space shuttle Discovery come calling to deliver and install another piece of the Japanese Kibo Module to the station. After that, things will quiet down for a while in terms of station assembly, while the shuttle program turns its attention to flying the final Hubble servicing mission, currently targeted for October. Congressmen should make note: After 2010 this will be the only way for Americans to get up to the space station. Talk to your senators. Tell them who space exploration is important. With the Iraq war over half a trillion dollars, it is unacceptable for the entirety of Science and NASA funding to be less than 4 billion per year. she is a scientist; she will be conducint experiments on the ISIS. please update/correct this blog entry.